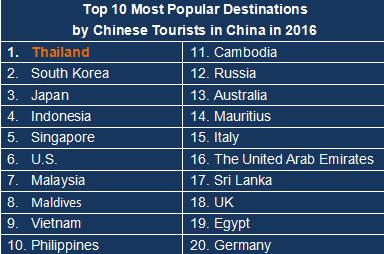 China Tourism Academy (CTA) issued "Tribute to the Chinese tourists - 2016 China outbound tourists large data". China Tourism Academy (CTA) , the official tourism research institute of China National Tourism Administration (CNTA), issued "Tribute to the Chinese tourists - 2016 China outbound tourists large data". The report shows that in 2016 the number of outbound tourism in China reached 122 million people, and Chinese visitors spent $109.8 billion (about 760 billion RMB) in overseas destinations. In 2016, with income growth and tourist consumption upgrade, as well as as well as visa, flight and other convenient factors, China’s outbound tourism heat continued. The number of China’s outbound tourists reached 122milion in 2016, increasing by 4.3% compared to the year of 2015 with 117 million outbound tourists. China has remained the world's largest number of outbound tourists for consecutive years. 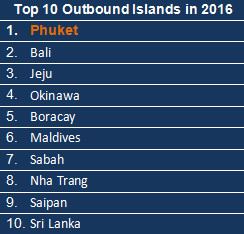 China has been the largest source of outbound tourists in Thailand, Japan, South Korea, Russia, Maldives, the UK and the other countries. However, China's outbound tourists are still less than 10% of the country's total population, and only 10% of the population hold the passports, which suggests huge potential in China’s outbound travel market. Total consumption by Chinese travelers overseas reached $109.8 billion (about 760 billion RMB) and $900 per person on average last year, accounting for 16% of the country's total tourism consumption, though the number of outbound tourists only accounts for 3% of the country’s total tourists. From the statistics, in 2016, more than 65% of the consumption is for outbound travel and 35% is for domestic travel. 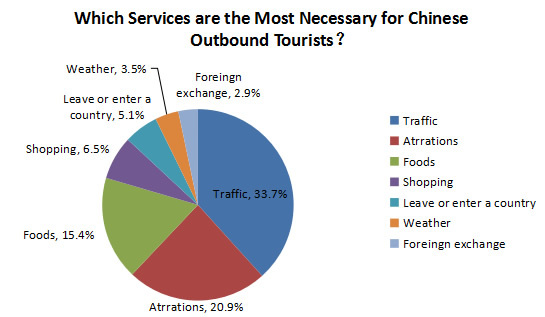 This indicates the Chinese tourist are increasingly keen on outbound travel. 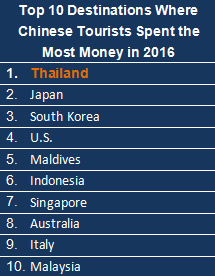 Statistics show that Thailand, Japan, South Korea, the U.S., Maldives, Indonesia, Singapore, Australia, Italy and Malaysia were the top 10 destinations where Chinese tourists spent the most money. 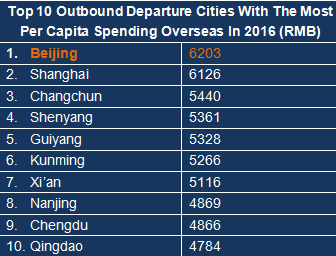 For the overseas cities, the top ten cities with the most spending of Chinese tourists are Seoul, Bangkok, Tokyo, Osaka, Singapore, Chiang Mai, London, Moscow, New York, Rome and Sydney. 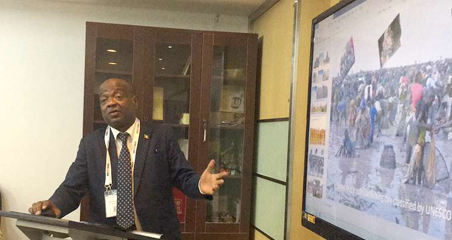 It is estimated that Chinese travel agencies organized more than 50 million tourists to travel overseas, most of whom are follow the group in 2016. Among 122 million outbound tourists, group travelers account for 40%, and individuals are over 70 million accounting for 60%. Chinese tourists still endear to group travel, especially in second, third and fourth-tier cities and regions, but individual travel will be an irresistible main trend in near future. 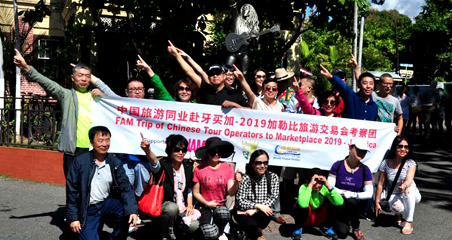 Chinese outbound tourists are increasingly interested in the new tourism products, such as the customized itinerary of hiking in Yakushima and watching turtles spawning according to Japanese Animation, or the medical tour for Cancer Screening in Japan. Statistics show that more and more tourists book the customized trips(400% increase), themed program(250% increase), entrance tickets(100% increase). In 2016, programs for outbound tourists become more diversified and convenient. Compared with men, female travelers are more likely to choose overseas destinations, with the latter making up 56% of China's outbound tourists. People born during the 1970s and 1980s made up nearly half of outbound tourists, but data shows that more and more younger people as well as the elderly have expressed the interests in overseas travel. In 2016, the oldest Chinese tourist is 101 years old. 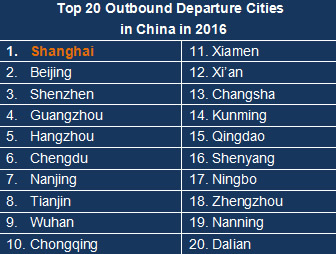 Shanghai, Beijing, Guangzhou and Shenzhen definitely are the four main doors to the outside world, while “New first-tier cities” also contribute numerous travelers whose consuming capacity are almost the same as the ones from first-tier cities. It has become much easier for Chinese passport holders to travel abroad. 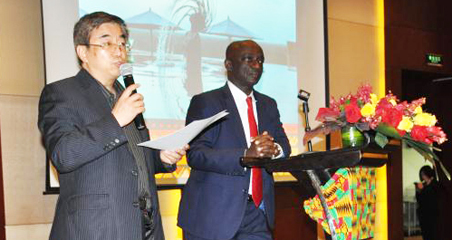 There have been 151 countries and districts opened as Effected ADS Destinations to Chinese citizen so far. By January 2017, China has signed visa exemption and visa-on-arrival agreements with 61 countries, increasing by 9 countries compared to last year. Many more European countries also launched the visa free policies to Chinese citizens. Serbia begins waiving visa requirements for Chinese citizens to the country starting from January 2017. Followed by US, Canada, Singapore, Korea, Japan, and Israel, Australia also agreed that Chinese tourists apply for a 10-year multiple entry visa to the country. Thailand, South Korea and Japan become the top three popular destinations by Chinese tourists, attracting more than 8.77 million, 8.04 million and 6 million Chinese tourists respectively in 2016. The number of Chinese tourists to Southeast Asia and South Asia grow fastest. 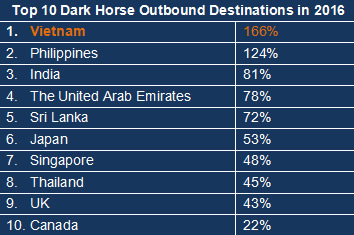 Because of the easing visa requirements, some of the countries become dark horse destinations receiving increasing Chinese tourists, such as Vietnam, Philippines, India, The United Arab Emirates, Sri Lanka, Japan, Singapore, Thailand, UK, and Canada. As the air pollution problem in China has been serious, air quality and natural environment have become important factors for choosing destinations. Sunny beaches with fresh air attracted more and more Chinese visitors. Island travelers accounted for 30% of the total outbound travelers. Family tours is very popular in outbound travel market. 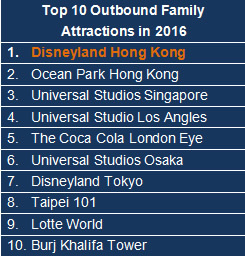 In 2016, Universal Studio in Singapore, The Coca Cola London Eye, and Universal Studio in Los Angles are among the top ten most popular family attractions. 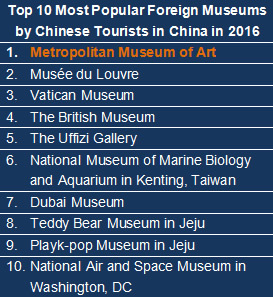 Metropolitan Museum of Art in New York, Musée du Louvre in Paris, Vatican Museum, The British Museum were listed as the top ten most popular foreign museums by Chinese tourists in China in 2016. 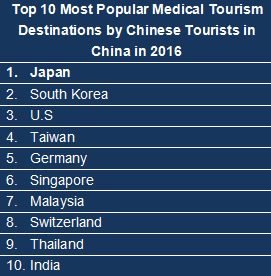 Nowadays, medical tourism has become more popular among Chinese tourists. Wealthy Chinese spend huge money on medical tourism.